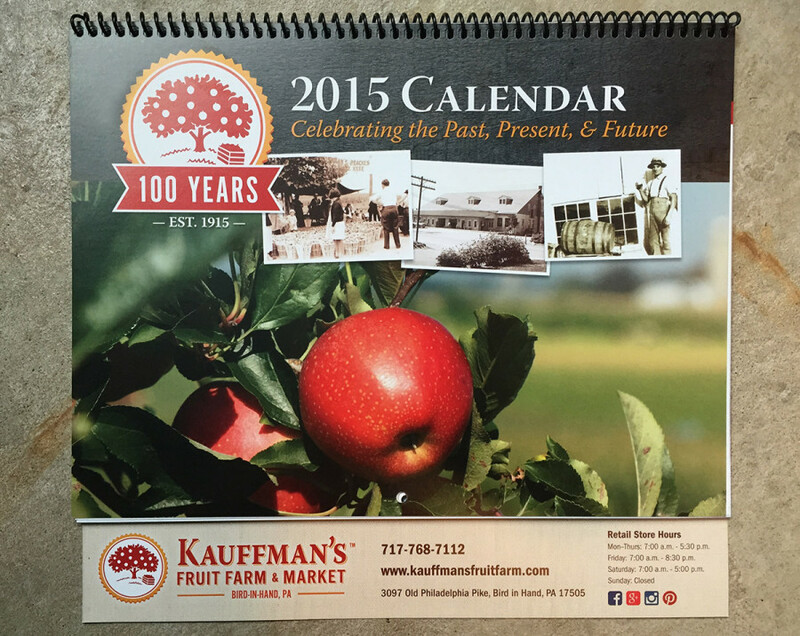 100th Anniversary Calendar - Yoder Design Co.
Stop by Kauffman’s and you might see one of the 100th Anniversary calendars I designed for 2015. I worked with marketer Jon Martin to develop a calendar that is functional, educational, and celebratory with photos of the orchard and market during its 100 years of existence. Included in the calendar is a fruit ripening schedule, so customers will know when to look for their favorite orchard fruit varieties. As part of the project, I also created a complimentary anniversary icon. Mark your calendar – Kauffman’s will be having an official anniversary celebration on September 2 & 3, 2015. Congratulations to the Kauffman’s family for this milestone. I’m honored that my design work could be part of the celebration! March 4, 2015 | Posted in: Print Design.